Due to the current situation regarding my job, I want to reblog a post from a couple years ago. Sometimes you are chances offered and since you won’t let them pass you take them. You are supported and learn a lot but after a while, it can happen that it doesn’t turn out what you expected it to be. You don’t feel comfortable and actually, it becomes a pain in the neck more and more. Maybe you even get sick from the expectations you cannot fulfill since everything inside you starts rebelling against what you are supposed to do. Instead of getting better over time, it gets worse and worse. You know that a change is inevitable. The tricky point then is to disappoint those who gave you the chances and supported you. Can you let them behind only that you feel better? Can you be so selfish since you know how they rely on you? Sometimes we have to be selfish to move on. Isn’t it actually selfish, too to stay where you are only because you can avoid a conflict with others or with yourself? Perhaps we are taught to make everybody happy but we can’t because there is always this one person being left unhappy: You! When we are going through life we can find ourselves in situations and circumstances which require our actions. It just happens due to the way we live and also in order to learn and develop from what we experience. Sometimes certain situations not only hold new elements but are simply new and scary all over. We are asked to decide whether staying in the old which we don’t want anymore for a long time already or taking that step into the new completely unknown which feels liberating and deeply scary at the same time. We are aware that we are standing in front of the point of no return. It can likely happen that we give in again since feeling guilty and perhaps selfish and taking the responsibility for breaking down everything and affecting the lives of others with it can be overwhelming. It is the moment when we need to step aside and reflect. As long as we are in the midst of the emotional stream we will break down physically and mentally at one point. Maybe we really resign because we cannot take it anymore. But that is exactly that point we need to look closer: Do I want to look back and say “I already made it so far but I did not take that last step only because I was too afraid”? We need to get into an observing and more objective position. We need to remember what brought us so close to that moment of changing our lives. Was it a mood? No, it was an inner conviction. We headed towards that point of no return because of a reason and we need to recall everything. If this recalling fills you again with determination and the knowing that the difficult way again/still feels as the right one then go! Life is more than what was! If we let us direct by our fears or insecurities we will always look at our dreams like at clouds which are blown away by the wind. If we want to live the life we feel as ours inside of us then we need to step up for it. Then we need to take the journey through the thorn bush and risk some scratches. The scratches will heal again but not going through will keep us from ever experiencing the side we already see in our hearts as the life we are supposed to experience. When a change needs to be made it is normal and actually a good sign that we feel emotional because it shows that what was has a place in our hearts and will always have. Life is change. Life is risking something. If we never risk a change how shall we ever know how it feels to really live? What makes us grow is not the security of our comfort zone but the inspiring fresh air of the world that is waiting behind. Our comfort zone is a small limited space within a universe of possibilities. Yes, it needs a bit courage to step over the limit line but you feel it in your heart when it is time to do it. Reflect, remember why you got at this point and motivate yourself for not backing out again! You don’t need to explain it to anyone. It is enough when you feel it deep inside that it is time to leave for more! Remember that all you do will lead you towards the destinations you are meant to arrive. The reason you are standing at a turning point is that you have either grown too big or that you learned what you needed and now can continue on the main street again. So, don’t be afraid and take action. Yes, we might disappoint others but as long as we don’t act in deliberately hurting others it is simply life. We are disappointed too and have to learn how to deal with it. Taking responsibility, making that step consciously, and following that path determined will empower you even more because you know that YOU did it. You stepped up for yourself and dared to take action! 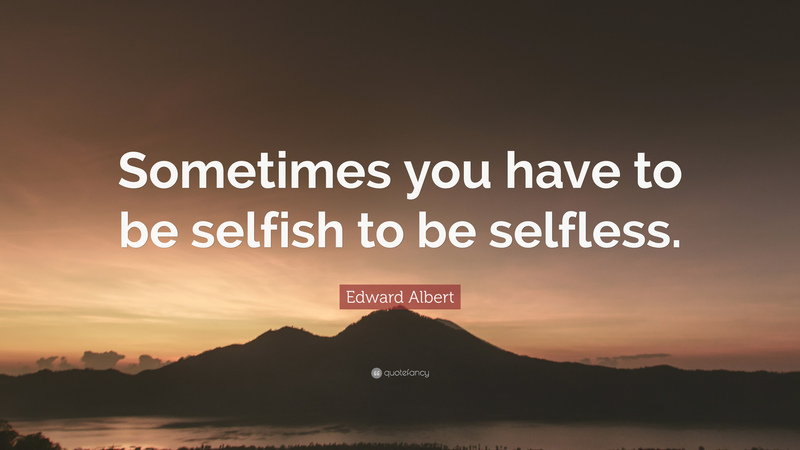 Am I selfish to be selfish?